I often pretend that I’m eighty years old. That’s a powerful thought, isn’t it? I decided then that I would try to live as much of my life as possible in the same way, and that is still one of my goals today. There are many things that I was wrong about when I was eighteen, but that wasn’t one of them. One of the ways I can check on myself and see how I’m doing is to pretend that I’m eighty. Whenever I’m making a decision or evaluating something I’m doing, I ask myself: How will I feel about this when I’m eighty? First of all, will I even remember it? (If the answer is no, then it’s probably not all that important, and if nothing else, I can bring down my worry level a notch or two.) If I do this, will I be glad I tried it when I look back at my life? Will I regret passing up this opportunity? Or will I wish I’d played it safer or made a different decision? I was talking to a former student the other day who has decided not to pursue music professionally, at least for right now. She went to professional school for musical theater for a while and began to hate it, even though she had previously been amazingly passionate about the subject. So now she is studying a different subject. And you know what? Even though she ultimately changed her mind, I think she did the right thing going through the musical theater program. Because if she hadn’t, then when she was eighty, she might have regretted not pursuing her dream. Now she knows that she doesn’t want that kind of life, and she can move forward without regrets. According to this article, one of the top regrets of people on their deathbeds is not having followed their dreams. (I highly recommend you read the entire article.) Of course, we can’t always be doing exactly what we want to do. No one wants to sit around recovering from a root canal gone wrong or clean the bathroom or deal with any of a whole host of problems and difficulties that are part of our daily lives. But I think all the unpleasant parts are rendered more manageable if we can find and highlight the aspects of life that are so wonderful to us that they dwarf all else. For me in college, that passion was for music. Nowadays, I find it in my relationships, in writing fiction and this blog, in teaching, in travel. When I’m spending time on any of those things, I get the same feeling, that there is nothing else I’d rather be doing. So now I’ll ask you the same questions: if today was the last day of your life, would you want to do what you’re doing? When you’re eighty, how will you feel about the decisions you’re making today? The photo for this entry is perfect! I’m pretty happy right now. Stoked to be married this fall, loving that I have time to write. 2011 has been a year of good decisions thusfar! What an excellent post. I had a similar moment in college. I was so stressed that I was mentally and physically falling apart, but I stopped in my tracks, looked out the window up at the stars, and savored where I was. I find that harder to do these days…I so rarely have the time and energy to do what I really want to do, or even to figure out what that is. But this past weekend was good. I spent it all studying Japanese and relishing it. I think sometimes college can be like a big pressure cooker that facilitates moments of clarity. As for not having the time and energy… sometimes we can only take baby steps. I wish there was a wand one could wave and hey! presto, everything in life is changed and fixed, but I think it’s actually a process, and sometimes a very slooow one at that. If you want to die without regret, I don’t think you should live each day as if it’s your last. I think you should live each day in a way that makes your dream as attainable as possible. Because of my own pursuit of the dream of being a published writer, I’ve met a lot of other writers pursuing their dream. Some of them put the dream aside because of needing to make enough money to support themselves and a family and then took it back up, finding little bits of time and energy here and there to support the dream, but only able to give it as much as it needed to flourish when they retired from what they were doing before. Others found careers or partners that allowed them space to pursue the dream. Still others lived hand to mouth so they could devote more time to it, but gave up adequate housing, healthcare, etc, which also made it harder for them to write. The third group seems to be the ones living each day as if it’s their last. But I think the first and second group have an easier time living their dreams. What that advice mean to *me* is to ask if today is contributing to the kind of life I want to have, and the direction I want to be going in. Some days, of course, aren’t going to do that. What I particularly like about the Steve Jobs quote is “too many days in a row.” If I am systematically NOT and NEVER spending energy and time on the life I want (which has happened to me in the past), then I think there is something wrong, and I will start looking for a way to change things. Everyone will have different options available to them depending on their circumstances, as well as different time lines for actualization, but there is often (perhaps not always, but often) a way to inject a life with more direction, or purpose, or passion. As for your example, I think any of your three groups could be living each day as if it’s their last, as long as they’re satisfied with how they’re spending their time. Living each day as your last does not *have* to signify hardship, discomfort, and struggle. Sometimes it does, but honestly, I don’t think I’d choose to be in the third group myself, but that has not made me like my life less or feel more regret. Being older than you and having just retired from teaching I have the perspective of the wise old woman in the woods. You know, I wonder where my youth went but then I remember dashing about….multitasking, raising and nurturing my son by myself, working and doing family things for my mom etc…but in the midst of it all I read, went to the theatre, took some special classes, worked on some creative pursuits such as community theatre, gardened, cared for my pets and laughed and cried with friends. I wish… a little… that I’d taken the path to be an actress but somehow it all kind of happened anyway. Things tend to work out. It’s corny, but just do your best and take a few safe risks now and then. No regrets. Hooray for wisdom! I’m so glad things have been working out well for you. It sounds like you were able to take time to nurture yourself and do things that make you happy. My biggest regrets are not standing up for myself as a kid (which includes not standing up to my mom about college) and the things I’ve done inefficiently or that I tried (and wanted) to excel at but was unable to do so. There’s are things I regret not doing, but it’s not the traditional “I didn’t follow my dreams”. I regret not getting into Magic The Gathering right after it came out; I was aware it existed, but had zero reason to get into it. I took one look at a game of it, though it looked complicated and confusing, and played Star Trek CCG instead (because I was a Trekkie). This was pre-Potter pre-LotR (movies – only then did I read the books); I had no reason to care about fantasy themed stuff or believe I’d love the game (which I did – 10 years later in college). I regret not taking a 3rd year of French in middle school as it would’ve been good in the long run, but I had zero interest in French and was going to take Spanish in high school (not offered in middle school). I regret half-assing it through grade school, especially high school. But I had zero reason to care at the time. I hated school and knew I was going to community college after high school so I had zero motivation. Then again, maybe my lack of regret for not following dreams is just because I rarely had any dreams to follow. Perhaps you’ll find some dreams to follow in the future? Or perhaps you have modest dreams that don’t pop out at you screaming “I’m a dream! I’m a dream!” Dreams don’t have to be huge and earth-shattering, I don’t think. Definitely. There was a time when I would’ve said no but I’m still following my dream. I believe that everything I do was a way to lead me to my dream. Even getting a job that’s not related to writing (I need the capital for self-publishing after all). It just takes a leap of faith and to believe in our dreams while smiling at the coming day. 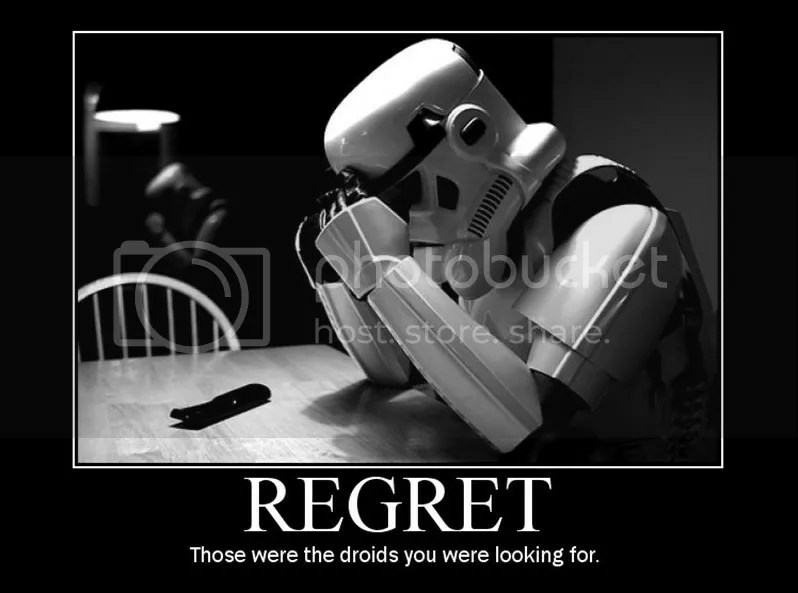 I’ve lived my life full of regrets. I’ve reached the point where I’ve had enough and I told myself that I won’t live in regret anymore. Wow this is what I needed to read 🙂 Thank you for sharing your thoughts on this. My dreams are ended but I think they were all fulfilled. I am happy now and only wish I had been heard. But we have the internet these days and everyone can hear us.